An urgent cry echoes through the dimly lit streets of Natick, Massachusetts early Monday morning on January 13, 1874 -- before invention of the automobile or the telephone, and just 10 years after the Civil War. Natick's local shoemaker Henry Wilson serves in the White House as Vice President under Ulysses S. Grant. On this fateful morning before sunrise, Natick's worst tragedy was about to unfold. Intense heat waves rise from flames 25 feet high, destroying 18 business blocks, two shoe factories, the Town Hall, Natick's only fire engine house and the Congregational Church, as well as many private homes. Much of Natick's population lived in this downtown area and were awakened by the shouting, the confusion in the streets. On the corner of Summer and Main, Natick's understaffed and poorly equipped Fire Department bravely fought the blaze, supported by fire companies from South Natick, Ashland, Framingham, Newton and Boston. In spite of their heroic efforts, by 7:00 AM – a short four hours after the fire was discovered – the downtown area was sadly and completely destroyed. The tragic loss was greater in proportion to the town's wealth than either the Boston or Chicago fires. Natick's downtown area lay in ashes. Though Natick was fortunate to have lost no lives in the fire of 1874, the townspeople of Natick were left in bitter shock and devastation. Somehow they found the strength to begin rebuilding the town's commercial center – starting with the town selectmen's approval of funding for construction of a new Firehouse. 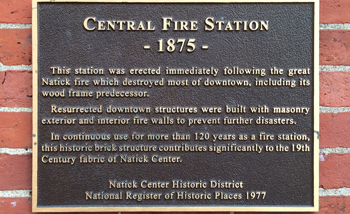 Twelve months later, Natick's new Central Fire Station was completed on Summer Street in 1875 and opened with grand ceremony on the same city block where the great fire was first discovered. Its four massive doors opened to large storage bays where horse-drawn fire carriages stood waiting under large leather harnesses, which were lowered onto the waiting horses at the sound of the new fire bell. 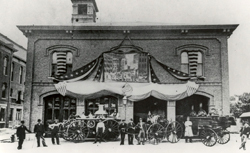 The state-of-the-art facilities rejuvenated Natick's firemen, inspiring their championship performance at the National Hook and Ladder competition in 1891 and winning Natick the proud title of "Home of Champions. As years passed, horse-drawn fire carriages were replaced by motorized fire engines. New facilities were built. 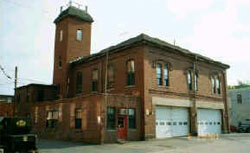 After serving the Town of Natick for over 140 years, the aging Central Fire Station fell into disrepair. By the early 1990s, the fire station itself became a fire hazard as exposed asbestos, a leaky roof, and an old and obsolete electrical system rendered the building unusable as a fire station. In spite of its historic past, a few Natick Selectmen proposed the sale of the building for office space, even suggesting demolition to provide a parking lot for downtown businesses. A group of concerned Natick citizens had other ideas. 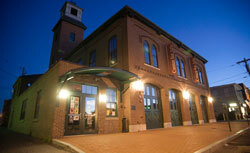 With determination and a clear vision, they fought successfully to purchase and restore the old Central Fire Station as Natick's permanent Arts Center, providing a venue for regional and national musicians, theatre groups, painters and artisans to share their work and enrich the cultural fabric of the MetroWest area. The plan would save the Firehouse, preserving this historical Natick landmark as a community treasure. Through the hard work and contributions of thousands of volunteers, sponsors and contributors, The Center for Arts in Natick was opened in 2003, providing a 290-seat performance space, state-of-the-art lighting and sound systems and the Summer Street Gallery for visual arts. The performance stage now hosts over 300 performances, movie screenings and classes annually, while providing local artists in Natick and surrounding communities with frequent performance opportunities. Most importantly, TCAN brings people together to share all forms of artistic expression. The Central Fire House in Natick remains a memorial to the dedicated people who rebuilt Natick in 1875, and, as The Center for Arts in Natick, it now stands as a tribute to those who combined their efforts in 1996 to restore the Summer Street Firehouse as a center of community life in Natick. In October 2005, the Firehouse and TCAN were recognized by the Massachusetts Historical Commission with a Preservation Award for the restoration and creative reuse of this treasured building. Noted highlights of the firehouse restoration included reconstruction of the original hose-drying tower, replacement of the historic cupola, restoration of windows and masonry, a new roof, and the return of the modified two double-bay entrances to the original four arched bays, complete with opening wood doors. The cost of the project was about $2.2 million, funded by contributions raised through TCAN's capital campaign. Many of these contributors are recognized as members of TCAN's Founders Circle of major donors. Our thanks to the Natick Historical Society and Museum for use of their archives and assistance in preparing this article. Visit the Museum at 58 Eliot Street in South Natick, next to the South Natick Dam.